Detective Constable Kevin Walker gets called out on an early winter morning because a farmer has discovered a body in his field. The victim was shot in the head and Kevin recognizes him immediately as a fellow villager who lived less than two blocks from Kevin’s home. Kevin had been called out before to sudden deaths, but this is his first homicide. He is assigned as the lead on the case, in spite of his relative inexperience, but he is overseen by Detective Inspector Ellie March of the Ontario Provincial Police. 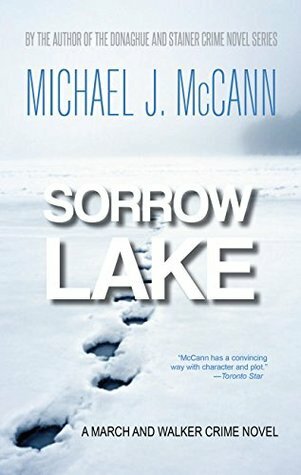 Sorrow Lake is a solid police procedural and the reader learns a lot about how a murder investigation is handled as well as exactly what it takes to make a case against a murderer. I really hadn’t realized just how many people are involved and how the evidence is gathered. I learned a lot. It did take me a bit to get into the novel because of all the people who were introduced right at the beginning. Keeping them straight was a bit of a challenge, especially when I wasn’t sure just which of them would prove to be truly important. I really liked Ellie March, and I enjoyed learning more about her background and history. I would have liked even more, as it really made her come alive. And Kevin is also a very likeable character. We learn a bit about him, but again, I would have liked more details to make him seem more three dimensional. I’m hoping since this is the first in the series that the succeeding novels will allow both of these fine characters to develop further. The plot is a good one, and it took me awhile to figure out who the murderer was. I’d pegged someone else at first, so I was intrigued by the way the story unfolded. There was a very exciting scene taking place on the ice of Sorrow Lake and I held my breath through it. I would have liked a few more scenes like that which show rather than tell. Much of a police procedural involves meetings and reports, which is accurate I’m sure, but that can slow the pacing. Sorrow Lake has done a great job as the first book in a new series. I am sure mystery fans will enjoy it and I look forward to the further adventures of Ellie and Kevin.